Alex Perry Hotel & Apartments sauntered onto the Brisbane hotel scene around October last year with true understated elegance rather than bellowing it out from its own rooftop swimming pool. And it's this same effortless chic style that emanates throughout the luxury hotel, fashionably located in the hipster and eclectic part of town, Fortitude Valley. That's not to say the attitude is by any means effortless, with a warm and friendly welcome from check in to check out. Along with beautiful service, the lobby and reception area, past the beautifully aligned decor at Delfina's Bistro and into your room, offers you trade mark Alex Perry glam. The rooms themselves fall into two subtle themes, Blonde and Brunette, with each lending either a lighter or darker decor. You're not likely to really notice or be bothered either way because the generous space that is your hotel apartment room is so suave, you're too busy thinking about for how long you can extend your stay, or to perhaps simply move in. This is certainly a space where you can relax and spend some real time at your home away home. Each room comes with a complete kitchen (oven, stove top, dishwasher, hotel fridge that fits a bottle of champagne - check), a desk and study space including WIFI, combined dining and lounge with a couch that you could happily sit or nap on for a considerable while (hotel sofas can be so uncomfortable! ), massive TV with Foxtel, a queen bedroom with its own signature mattress that's almost like sleeping on air, hanging space, plus a shower bathroom with European laundry. The devil is in the detail to make this place feel even more liveable - make up removers as part of your bathroom amenities kit, timber coat hangers favoured by the gents, padded and silky coat hangers for more delicate numbers, not to mention the fancy GHD Air Professional - naturally! And while you wont find a mini bar around, you will find a menu from Delfina's for restaurant quality Australian cuisine with a European twist, delivered straight to your room. To unwind with a bit of fresh air without needing to leave the hotel, the expansive and exclusive, guest-only rooftop is right on the money. 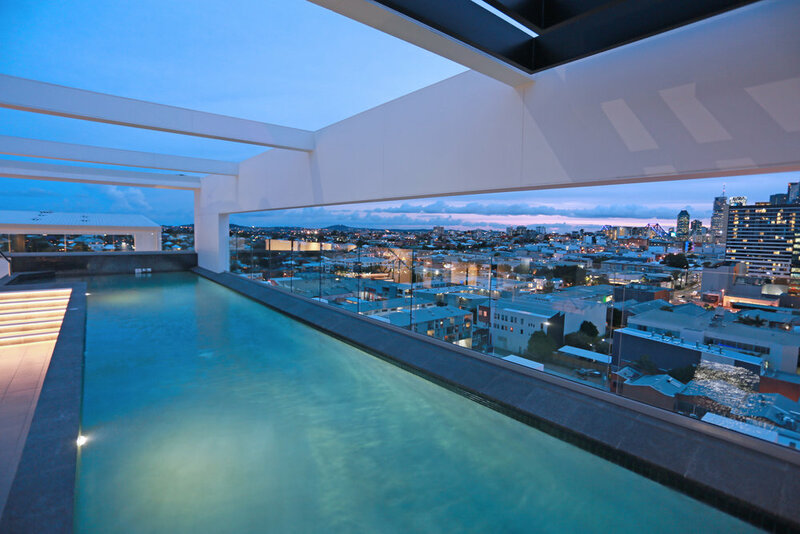 Take a dip in the outdoor heated pool, hit up the gym with a view, or chill out on one of the day beds as you take in sweeping views of the Valley, CBD and Story Bridge - a sparkling delight by nightfall. While the Valley may have had its shortcomings in previous years, better known for a seedier contribution to the Brisbane night life scene, this area which is just a stone's throw from the CBD has cleaned up its act and is now considered the cooler part of town to eat, drink, live and hang. Just steps from Alex Perry Hotel & Apartments in one direction is the Emporium Brisbane, a retail and dining destination with anything from a bottle shop and quick burgers from Grill'd, to fancy interiors or clothes shopping, a wellness spa, pharmacy, and a few bars for a cocktail or two. Step in the other direction and you're a few paces away from gluten free, vegan and tasty brunch or lunch at Nodo (not open Mondays) or a light stroll to the bright lights, fancy eats and fabulous threads of James Street. With the space that it affords its guests, the convenient location and nearby hospitality and retail attractions - not to mention its savvy and sophisticated edge - Alex Perry Hotel & Apartments makes for a luxury accommodation alternative that's ideal for short stays, business travel, city get aways without the bustle or wedding preparations. Rest assured that with a zero tolerance approach to parties, you'll get all the beauty rest you need here. To share this Brissy beauty with you, my accommodation was kindly provided courtesy of Alluxia and Alex Perry Hotel & Apartments.